In the world of pre-packaged Pop Idols and tweenage pop, Sugababes stand out from the pack. It was the same back in the day when they first hit the charts with the top 10 smash "Overload" amongst a host of post-Spice Girls pap. Now back with a new line-up and a track straight out of the underground, "Freak Like Me" mixes up Gary Numan's "Are Friends Electric" tuneage spliced with an Adina Howard vocal. 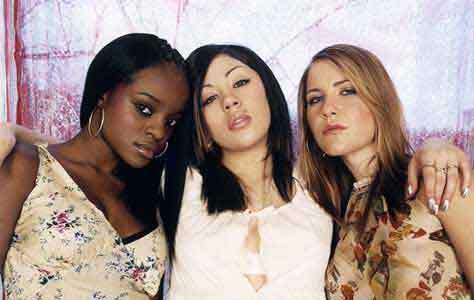 We caught up with old skool Sugababe Mutya Beuna as they look set to knock Oasis off the top spot. Q: New label. New Line Up. New Single. How does it feel to be back? A: It feels much better. 10 months we've been away for and now were back out there doing what we were doing with got a new member and new record label so its cool. It feels really exciting now that everything's going so well for us and it was kind of hard because we were not sure how people were going to respond to us with a new member and everything. Q: "Freak Like Me" out this Monday (22nd April). A bootleg mix of Gary Numan's "Are Friends Electric" and Adina Howard. Tell us more? A: It was a white label bootleg last year and it was given to us by our A&R to see whether we liked it or not. Me & Keisha new the Adina Howard track from 1994, so we tried it out and everyone was like that's the first single!!! It wasn't actually meant to be, because we had the album planned out and everything. Q: With the way the music industry works, you do realize its going to spurn a million other rushed bootlegs to cash in on the trend. So what do you think of the whole bootleg culture? A: Oh gosh, I had no idea. The idea is really cool of mixing two songs together. That's what makes it special really because sometimes people don't think you can mix two songs together and make it sound good. But Gary Numan and Adina Howard, not just because we've done it, but in general I think its really good to mix and 80s track and a 94 track together. Especially if its R&B and electronic because that's just two combinations that sometimes cannot be done. Q: The other mainstream bootleg track is Kylie's "Can't Get You Outta My Head" with New Orders "Blue Monday". What do you think of it? A: I really like it, its the one she performed at the Brits isn't' it? I think its got a really catchy beat with it. She's cool....doing really well!!! Q: Sugababes have always been cooler than the other girl groups around. Would you say so? A: People actually do say that. In general were quite laid back, we haven't been trained to anything so everything that you see is actually coming from us...so its not the coolness. I think in general were just really laid back people and were not like lets run about the stage. We like to keep things real and that's just the way we are.....which is a cool thing!!! Q: You've got an album ready and I know you're really big So Solid Crew fans. Is there a garage influence creeping on the new tracks? A: There is influences from garage, but I wouldn't say its a full on garage thing. There's a lot of hip-hop, rocky, r&b tracks and a few dark indie tracks. Its pretty much the same as our first album, we don't want to change anything as that's what made us, but at the same time we haven't really found the Sugababes sound so we can't really say we based it on one type of music. We leave garage up to Misteeq because were really good friends with them and they're heavy with it. Id' rather listen to Misteeq's garage than our garage. Were still working on what kind of music we like to do and that's just all different types really. Q: The original line-up was started when you were back at school as friends. How is it working with the new line-up and was it strange to essentially have a stranger coming in? A: Me & Keisha went to the same school, Siobhan went to a different one but at the same time we were all friends. In the beginning it was strange because I wasn't sure what to think. It was like we've got a new member, what's she like and I'm going to have to get to know her....and obviously being with Siobhan for four and half years I knew her. Afterwards I got to used to it and I know her know. Everything she does it quite cool and she's really talented which is the main thing. Q: Why did Siobhan actually leave and do you still keep in contact with Siobhan? A: This is going to make me sound really really bad, but I haven't. I haven't actually spoken to her since the day she left. From what we know she wasn't happy. When she left she didn't actually speak to us....we all went back to our hotel room in Japan and we were told "Siobhan has left, she's on her way home". So we were obviously shocked. We had 4 days left until we went back home, so Keisha and I stayed on for promotion. We thought she would have probably changed her mind by the time we got home, she didn't change her mind so we just went straight on with auditions. Q: What does Heidi add to the Sugababes sound that Siobhan didn't? A: I'm not going to dis Siobhan, because Siobhan had talent - she was a really good singer and she had looks. And Heidi has got pretty much the same things so none of them are better than each other. We knew Siobhan for longer which is something more special, but what more can you do, when someone's not happy you can't force them. Q: What do you think of the way pop music is heading since you've been away with Pop Idol and these really young acts like S Club Juniors? A: It depends on how you bring it out into the audience, because it can either be cheesy or....were really young but we can still make it as a cool band. I mean S Club Juniors, they're really really young, but if they are done properly they can be really really cool. I think there is a lot of really bad music out there, and I'm not trying to disrespect anyone because everybody is out there trying to do their thing, but at the same time nobody's thinking about music anymore - its all about image and how music sounds. If its sounds baby-ish we've got the young crowd. I just think its really pathetic sometimes. I think if you're just doing it for the fame, there are other ways to become famous. Its really bad because there are people like us that really don't get a good look in....because there are groups and solo artist out there taking over the charts that have no talent!!! When I was six or seven I was looking up to people like Whitney Houston and Mariah Carey. And who are the little ones looking up to now? Pop Idols or S Club Juniors. So you can't really persuade anybody to get into the music business because everybody wants to get into it because of the fame. It doesn't work that way. Q: Looking right back to the beginning did you find it hard to be accepted? Female, really into music and have opinions. A: I think people weren't sure because there were 3 young girls called Sugababes who if nobody had heard our music would think we were a really bad pop group. We just about got away with it and we had NME, The Face and everybody supporting us which was really cool. I thinks its kind of cool now that we can go out and do CD:UK or the Saturday Show because were getting to play to people our own age. At the time there were a lot of adults into us and its about time that kids or teenagers get to listen to what music actually is. Q: So next Sunday. In at the number 1 to knock Oasis off the top spot? A: Do you know what? It would be nice to go top 5. Were just thankful for where we go really.